Yes, October was very busy. See? It's November now. We ate lobster. Lobster is good, but it's rather labor-intensive, if you just have a boiled/steamed lobster. Personally, I want somebody else to crack the thing open and pick all the meat out for me. I feel the same way about crabs and crawfish. I will consent to peel shrimp, but only if they're boiled without heads. Those heads have to come off before I sit down to eat. Anyway, I ate lobster bisque, lobster mac & cheese, lobster roll, and something else lobstery. The fella did the boiled lobster eating. It was a lovely division of labor. Or whatever. I also went to Valley Mills for the annual Heart of Texas RWA chapter fall retreat and wrote for several days. And now I have posted a new/old book--I wrote it a while back, but I still like it... It's the sequel to one of my old Silhouette Desire books, Her Convenient Millionaire, which was published back in '03. 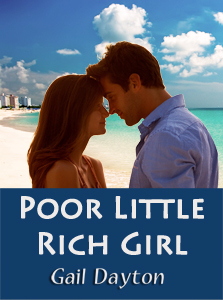 Poor Little Rich Girl was never published until now. It's another marriage of convenience story set in Palm Beach, about the sister of the heroine in the first book. It should be up at Amazon and Barnes & Noble tomorrow or the next day, so take a look. What else? Daddy wound up not having any surgery--we decided it would just upset him for very little result. And besides, we had to move him out of the nursing home where he's been for the past year & three-quarters. They couldn't handle him any more. So we moved him down here near me to a place that specializes in assisted living for Alzheimer's patients and other folks with dementia. It's a really nice place, and he seems to be responding really well. We kind of hate having him where Mama can't visit when she wants, but he can't really carry on a conversation any more and it upsets her to see him so bad. And then she can't remember going. Or thinks she did when she didn't. But it's been good for him, so we're okay with it. I took some pictures of him with my tablet, but haven't figured out how to do the upload thing from it, yet. The daughter wants her dad to come see their new house in Georgia, so we're going there sometime this month. And since he occasionally has meetings in Georgia, we'll get to go visit more often. That's happy-making.